A young boy left to run the family flower stall alone. A symphony cellist, whose chosen means of resistance is his music. Together, in their own unique ways, they demonstrate the power of beauty in the face of violence and suffering. 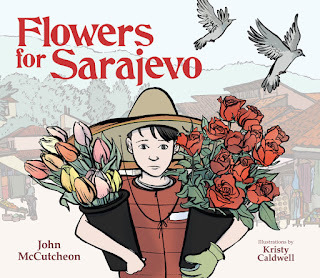 Based on real events of the Bosnian War, award-winning songwriter and storyteller John McCutcheon, author of Christmas in the Trenches, joins with debut illustrator Kristy Caldwell to share the uplifting story Flowers for Sarajevo. When twenty-two people are killed by a mortar at the local bakery, Drasko isn’t sure that his beloved town will ever be the same. But the next day a symphony cellist walks to the bombsite and plays a piece of heartbreaking music. The cellist returns for twenty-two days to play, one day for each victim of the bombing. Inspired by the musician’s response, Drasko finds a way to help make Sarajevo beautiful again. Not only does the book contain stunning graphic artwork and extensive back matter—an author’s note, sheet music, and background history of the region—but also a CD featuring a recording of the “Cellist of Sarajevo” himself: Vedran Smailovic. He accompanies McCutcheon on “Streets of Sarajevo,” and also performs the melody that he played in 1992 to honor those who died in the Sarajevo mortar blast. A conversation with McCutcheon about the project and folk music is also included. Here more about making Flowers for Sarajevo from the author and illustrator themselves! Look for this title on April 1st at your local library, indie bookstore, or Barnes & Noble.